Author: O'Donnell, Edward T. Set In . 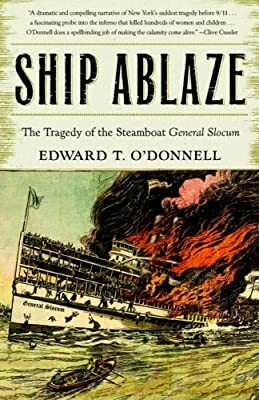 . .
On June 15, 1904, the steamship General Slocum was heading from Manhattan to Long Island Sound when a fire erupted in one of the storage rooms. Faced with an untrained crew, crumbling life jackets, and inaccessible lifeboats, hundreds of terrified passengers--few of which were experienced swimmers--fled into the water. By the time the captain found a safe shore for landing, more than 1000 people had perished. It was New York’s deadliest tragedy prior to September 11, 2001. The only book available on this compelling chapter in the city’s history, Ship Ablaze draws on firsthand accounts to examine why the death toll was so high, how the city responded, and why this event failed to achieve the infamy of the Titanic’s 1912 demise or the 1911 Triangle Shirtwaist Factory fire. Masterfully capturing both the horror of the event and heroism of men, women, and children aboard the ship as the inferno spread, historian Edward T. O’Donnell brings to life a bygone community while honoring the victims of that forgotten day.